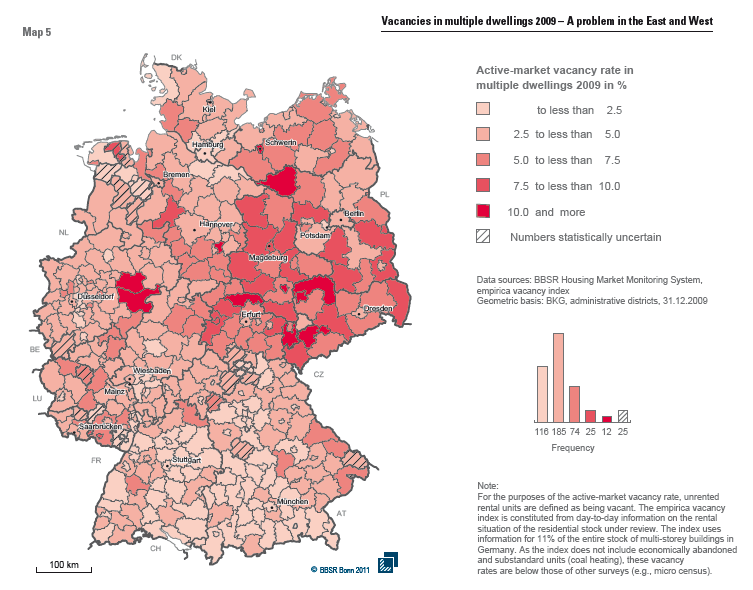 Vacant housing in Germany concentrates mainly in the Eastern states (former Democratic Republic) and in some western rural areas. According to data from the Federal Institute for Research on Building, Urban Affairs and Spatial Development (BBSR), but for some exceptions the vacant homes ratio is under 10%, and the most often under 5%; the ratio is under 2,5% in Hamburg, and under 5% in Berlin. But the notes joining the map make me suspect that these ratios are not fully comparable to those used in other countries due to methodological issues. Anyway, demographics make for a future increase in the ratio.